Do you feel tired and worn out after a full day of work and family duties? Like many folks in this great country, you’re asleep before your head hits the pillow. So why do so many folks choose to pick up another opportunity to serve their community? For many of those who support Kicking Bear Ministry, it’s because of a greater calling, an eternal purpose. It’s called mentorship. In this story, we will talk about a couple of local table sponsors and what motivates them to continue to give more, in supporting both the Kicking Bear Banquet and mission. To begin, we would like to personally invite YOU, (yes you! ), to come to our 2019 Kicking Bear Banquet! It will be held at the Omni Center in Onalaska, Wisconsin, on Saturday, April 6th with doors opening at 4:00pm and dinner served at 6:00pm. Please pre-register here, so we will be ready to greet you. The ability to consistently achieve a positive return on an investment in the financial world is a sign of a high-quality company. 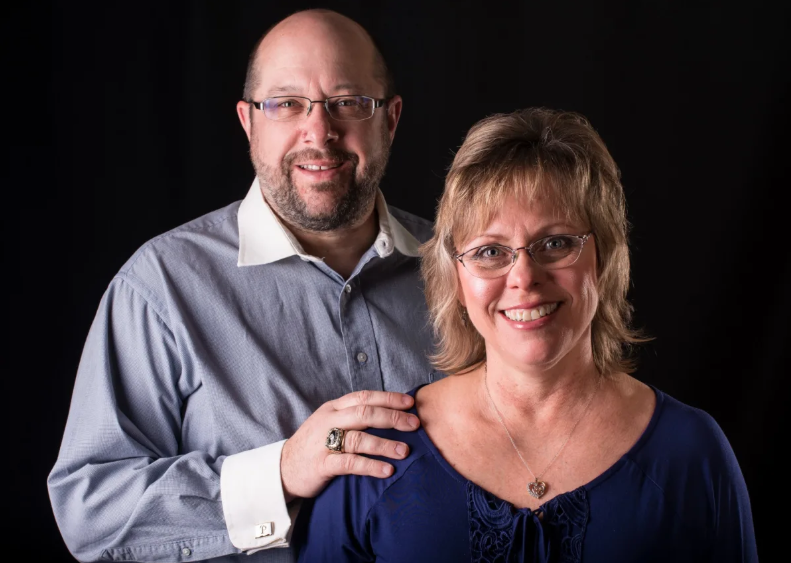 For Kurt and Meg Pfuhl (pictured below), Senior Vice Presidents of Primerica in La Crosse, the return on their investment that matters most is when a person comes to know and accept Christ as their personal Lord and Savior. When it comes to donating monetarily to Kicking Bear Ministry for the past 8 years, Kurt said it best: “Kicking Bear is a great organization that impacts kids’ lives, and we need that. Those kids, in return, go out and positively impact the lives of other kids.” This is what’s called generational change, and this is how an eternal impact is made in our communities. While talking to Kurt about why they choose to support Kicking Bear Ministry, the word “impact” kept coming up. Kurt and Meg invest in sponsoring a table at the banquet because it gives their family and friends the opportunity to experience Christ’s message in a nontraditional way—whether it be listening to mentorship testimonials, watching people at their table and others around them accept Christ into their lives, or by being moved while hearing Ray and Karen’s story. That is the greatest return on an investment they could ask for. Kurt said, “The fact that every penny from the banquet goes directly to the camps and the kids, makes it all worth it.” At a recent banquet, one of Kurt’s friends said, “I’ve been to many different kinds of banquets, D.U., NWTF, etc., but I’ve NEVER been to a banquet like a Kicking Bear Banquet. I’ll be coming back every year!” That sure is motivating. 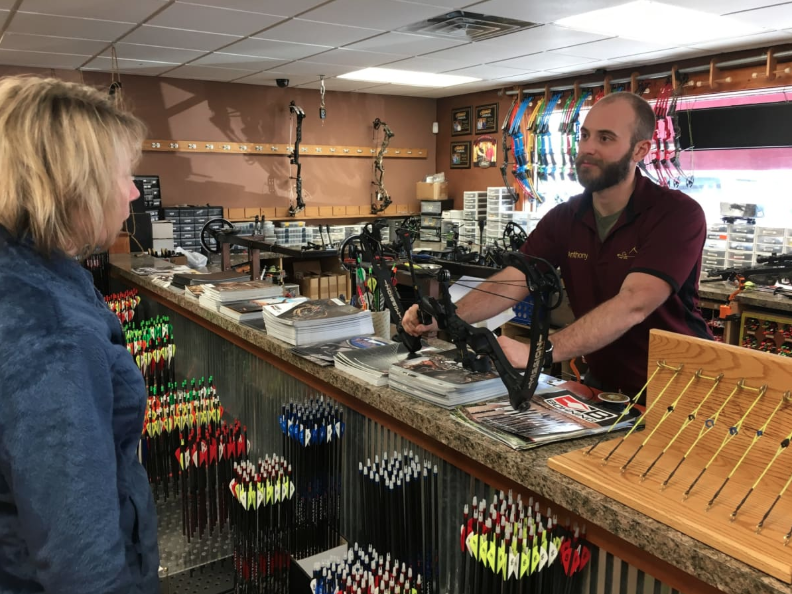 When you walk into the incredibly well-known archery shop in La Crosse, your eyes will likely become captivated by the amount of the top-of-the-line hunting gear and archery accessories. The truly captivating aspect of La Crosse Archery is how many people will be shooting, preparing, or simply hanging out the WHOLE time they’re open. Showing up around 2:45pm on a Monday to chat with Anthony (below), co-owner, there was one available parking spot in their lot. That’s not at all typical of archery shops, unless there’s something special behind their front doors. When asked why they decide to not only sponsor a table, but also to shut down business for a day to host a Kicking Bear Adventure Day in their shop, Anthony said, “Listening to the testimonials at the banquet and watching the kids light up when they shoot a bow for the first time is all the motivation we need and is directly in line with our family values and beliefs.” Anthony also believes that it’s one thing to give money to an organization, but it’s another to get involved. When they see the donations and hear the testimonials, it makes all the extra hours worth it, and it excites them to be a part of the program through the coming years. The partners and communities that are involved with Kicking Bear have helped bring the organization to heights that only a great God could have designed. The generational impact Kicking Bear has on the communities where camps are held is what motivates many table sponsors and volunteers alike to become more involved with Kicking Bear. Every donation, final bid offer, and sponsor dollar at the banquet goes directly, and only, to put on the free camps for kids around the country, and this is the reason why many of the folks attending the banquet support the mission of Kicking Bear Ministry. As Anthony of La Crosse Archery stated, when your values and beliefs align so well with an organization, it is very easy to figure out ways to support and become involved with that group. Those “impact” moments that people experience at the Kicking Bear Banquet go far beyond the dollar amount raised. Join us, and come see for yourself, it will change your life.